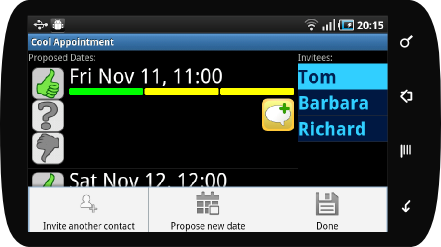 Plan your Private or Business Appointments from your AndroidTM Mobile, in few Steps! It's Easy! PleftDroid is the App for the Pleft service , which helps you plan your Appointments online. Now you can do this directly from your mobile, taking advantage of the e-mail addresses you already have in your phone contacts! (OPTIONAL) Install your own Pleft Server from the Pleft Google Code project page, It's Opensource! Download PleftDroid from here and install it on your mobile (requires Android 2.0 or later). and now start creating your appointments! The first time you start the App, you will be presented with the Preferences screen. Just enter the server address, your Name and your e-mail, and you are ready to start. From the main screen press Menu and then tap on "Plan new Appointment". Key in a description, choose invitees from your contacts with an e-mail, choose the dates and times. When you are ready, tap on "Send invitations" to create the appointment on the Server. Before to send invitations, Pleft needs to verify your e-mail for security reasons. Open your e-mail app, you should have received a Verification message from Pleft. Pressing the link will open a dialog to choose the app to open it with: choose PleftDroid. from the e-mail verification message, although it is a bit more complicated. (to share the link you need to long press the link, then choose the "share link" in dialog, then choose PleftDroid). Once you verify your e-mail Pleft will send the Invitations. And now, just vote the dates and have a look how the other participants voted, to find the right date! Your changes will be saved either by pressing the back button or pressing the Menu button and then tapping on "Done". PleftDroid graphics by Riccardo Massera are licensed under a Creative Commons Attribution-ShareAlike 3.0 Unported License.